In Calculus, we just finished our limits unit. I gave a test. It had a great question on it, inspired by Bowman and his limit activity. Which reads: “Scratch off the missing data. With the new information, now answer the question: What do you think the limit as x approaches 2 of the function is (and say “d.n.e.” if it does not exist)? 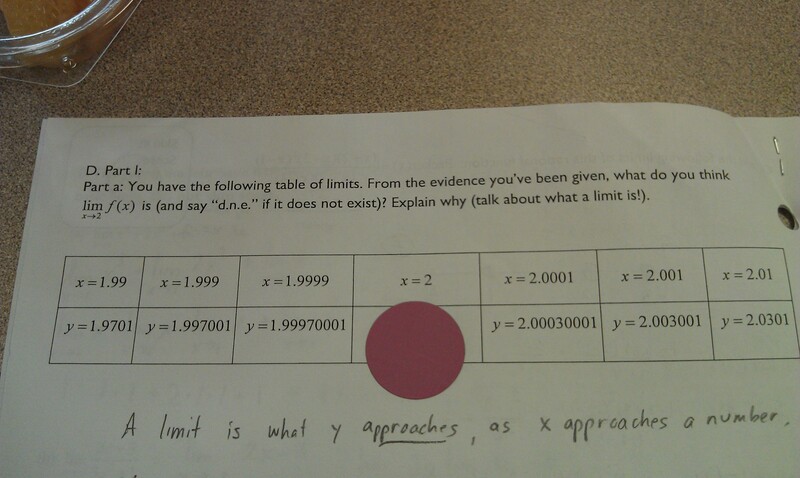 Explain why (talk about what a limit is!). the other kind of thinker, who will get the problem right and for the right reasons. What’s the difference between the two kinds of thinkers? My guess: confidence. More than anything, this is a question that really gets at how confident kids are with the knowledge they have. You have to be pretty sure of yourself to come up with the right response, methinks. It’s a great question… my favorite test question of all time I think… but I wonder if that’s because of the scratch off. I know we don’t tend to share student work often on blogs, but I asked and my kids were okay with me anonymously sharing their responses. I don’t know exactly why I wanted to post student work. I don’t have anything specific I wanted to get out of it right now. But I know I was fascinated by it, and I figured y’all would be too. Yay student thinking, confidence, stuff. Okay I really only want to ask: how did you make the scratch off part?? I love this question! And not just for the scratch off (although that is AWESOME). Questions that really make the kids think about what they’ve learned are what it’s all about. Limits problems can so easily get bogged down with algebraic manipulations, it’s great how you brought it back to basics in a way that highlights the relationship (or lack thereof) between limits and continuity. Yay for all the kids who drew pictures! Hope you don’t mind if I steal this for my calc class…. Obvi! Beg, borrow, steal. A teacher’s motto. Nicely done. The scratch-off is something truly unique I haven’t seen before, and students will get the problem right for the right reasons, and wrong for the right reasons. – The problem says it’s a “table of limits”, but really it’s the input-output table of a function. – The problem asks to find the limit of f(x), but the table gives “x” and “y” values. The table should should maybe just have labeled rows x and f(x) then the direct data. – Is there a reason you have the kids say “DNE” and not “does not exist”? Just curious! Thanks for pointing things out. I’ll fix them on my electronic copy. As for DNE, it’s just something everyone in my school does. I think I did it too when I was in high school, but I’m not 100% sure. I really like these types of questions as well. I teach 9th graders, so often I hear “That’s a trick question!”, when really it’s a simple matter of, as you said, being confident in your understanding. If you really understand it, then the answer is pretty straight forward. Keep on being awesome Sam! Oooh! If you have a bunch of good questions, would you share? Very nice question. Just not sure why the table is described as “a table of limits”? Shouldn’t that read “a table of values”? 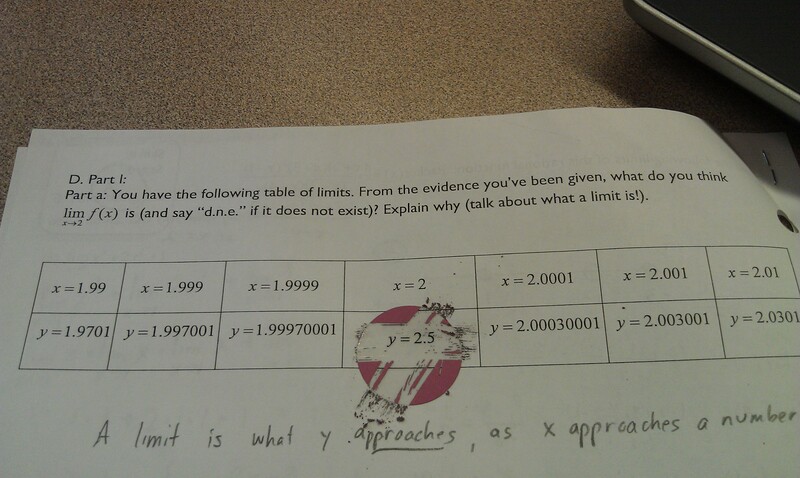 I like the spirit of this problem and what you’re getting at (and I LOVE the scratch off, thanks for that idea), but I think we always have to be careful about making it right for students to automatically assume that patterns continue in math, which just adds fuel to many of their assumptions that say six data points or examples constitutes a proof. I only give pattern problems with a caveat, “assuming the pattern continues,” but of course, your pattern does not continue. So, you are asking students to make assumptions about x=1.9999999 and 2.000001, but not about x=2. After all, you could have x=1.99999999, and y=-456.2345, there’s no reason why not. We talk about how a table of values don’t give you 100% confidence in your answer for a limit… But you want to use the evidence you’ve been given and come up with the MOST sensible answer WITH WHAT YOU HAVE. Yes, that might make sense to do! I would have had to have more class discussion about these matters to feel comfortable about putting that part (c) on there, but I might next year. I love reading your written comments because I can picture you in your apartment shouting YES and NO at your students’ quizzes…. I say this because I do this and feel like a crazy person. Now I feel a little less crazy. Sometimes I write a lot, sometimes a little. I’ve gotten to writing less, lately, because I want kids to figure out what they’re doing wrong independently. One of the reasons I find value in your posting the student work is that when we plan future lessons on this topic we have student work to refer to so that we can anticipate student responses and misconceptions. It’s a great deal easier to plan questions in advance that will help students come to see their misunderstandings on their own than it is to come up with a response “in the moment.” In the moment it’s too easy just to “explain” the misunderstanding but I don’t think that’s as effective as when they come to the realization on their own. So, thanks! I’m thinking I am going to steal this for my upcoming exam for my college Calc. I classes. I’ll have to blog about the experiences when all is said and done. Thanks for the idea! Thank you for sharing such an excellent question. I used this question on my second AP Calculus AB quiz covering limits, and found that for many students, despite discussing the approach vs at-the-value issue, they still had conceptual confusion. Or possessed a lack of confidence concerning their answer to part (a). It was amazing how many students could correctly address part (a), but change their minds for part (b). Pingback: The script is dead. Long live the prompt!